On this episode of the MileSplit Coaches Corner Podcast, we spoke with the co-head coach of Mountain Vista High School (CO) Jonathan Dalby. 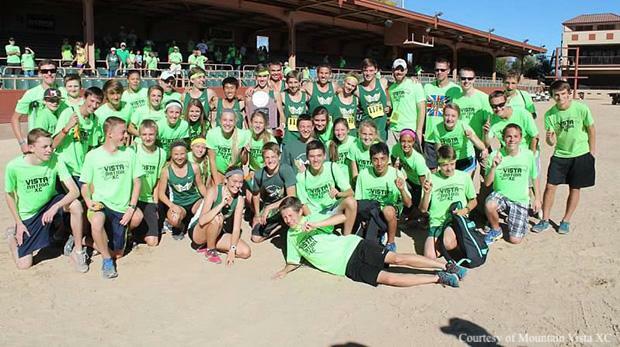 Mountain Vista currently sits at #1 in our girls MileSplit50 rankings and their boys are right on the top 25 bubble. They opened up with big victories at the Liberty Bell Invitational on September 8th where there boys beat a solid Niwot team even without sub-15:00 man Easton Allred and their girls won decisively with a 17:54 1-5 spread and 64 second 1-5 spread. They followed this stellar performance up with second and first place finishes by the boys and girls respectively at the Dave Sanders Invitational. Not only is the girls team ranked #1 subjectively, but they are also ranked #1 based on our XC Team Scores feature. Led by Jenna Fitzsimmons, the Golden Eagles are the only girls squad in the country with a 1-5 average under 18:00. The boys are ranked #2 in the country based on this feature, but that is with Allred at the top of the squad, who is currently ineligible to compete in state-sanctioned competition due to his recent transfer. Listen to Coach Dalby talk about his personal running journey, being friends with an Olympian, preparing his squads for the rest of the season, and so much more on this week's episode!